We love Australian mangoes. During the peak of the mango season, we can buy them in boxes and at a very affordable price. This recipe is so simple and so yummy! And I think it is a perfect guilt free dessert for a hot summer because it is sugar and dairy free. Enjoy. 1. Peel mangoes and grate on coarse side into a large saucepan. 2. 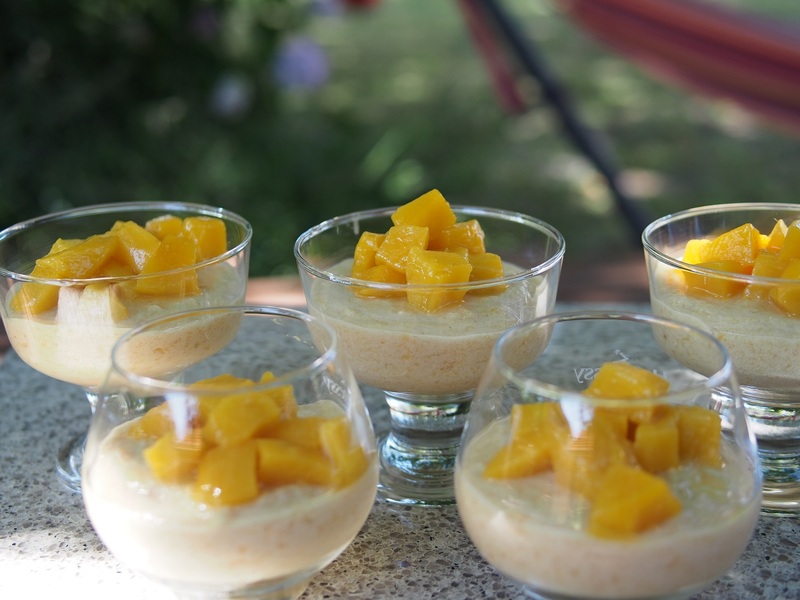 Combine the coconut cream and the mango mash. Place over a very low heat just to keep it warm. 3. In the small saucepan mix water and Agar. By using a silicon spatula constantly mix the Agar water on medium heat until the mixture thickens and starts to boil. 4. Immediately add boiling Agar making a thing stream into the mango mix continuously mixing until well combined. 5. Without delay transfer the mixture into the pudding form or individual serving glasses. Decorate with fresh mango pieces.